Design a CARD BACK for your own FULL DECK of custom poker-sized playing cards in minutes with our NEW slick online designer! Add photos, clip art, shapes, text, colours, designs or anything you can think of. You will have complete control over all elements of your design. You say you are not very creative? Then simply upload a favourite photo and be done, or choose an editable design from our ever growing gallery of templates; tweak it a bit and call it your own! Either way, they're going to love it. With this option you can add artwork and customize every single card in the deck, including 2 Jokers... that's 54 different images or designs! If you include the common card back image, you can have 55 different images. 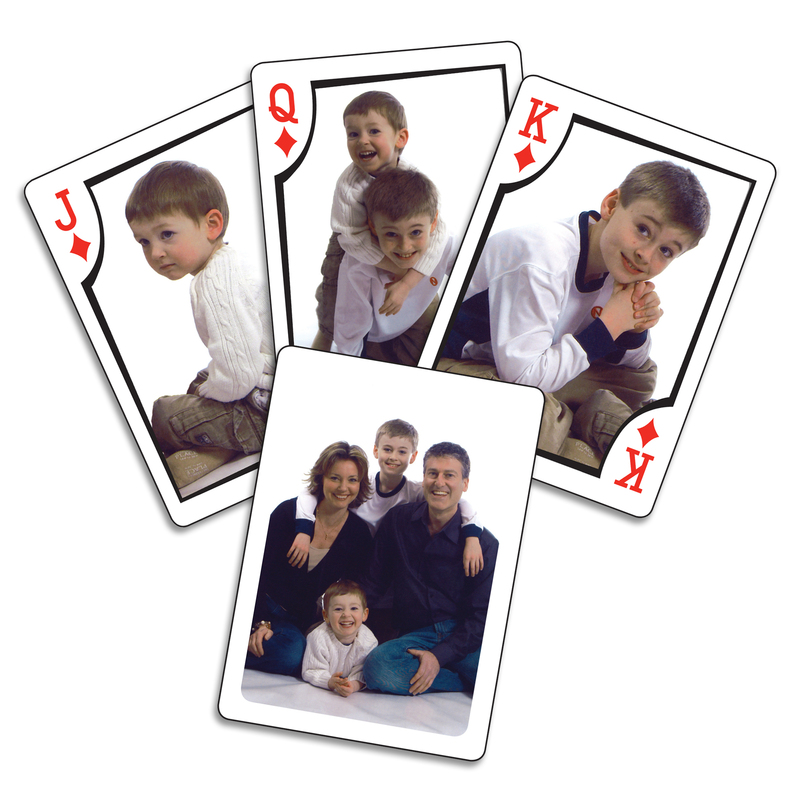 This full deck of 54 poker sized playing cards is very popular for weddings and corporate promotional decks. 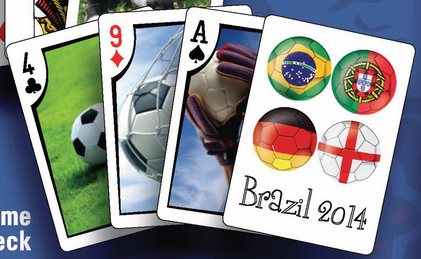 You can use up to 12 main images to customize the 12 different face cards; all the jacks, queens & kings. The common card backer will also need a photo or design to complete your deck. Simply replace our stock photos with yours and choose whether or not to use one of our pre-loaded card frames or borders and you're done. 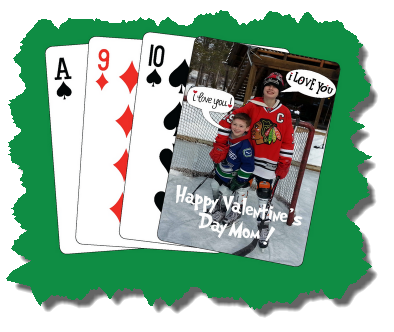 You can add as many photos, images, and graphics as you want to each of the editable cards. Some people have created collages or a mini-photowall on each card to cram in as many photos as they can. You do not have to add photos to each card if you don't have enough. Simply delete our placeholder image to display the typical playing card picture for that card. The remaining cards (Ace-10 and 2 Jokers) are not editable on this particular product. NOTE: this is just an empty box. If you wants playing cards as well, you must order decks of cards as well. Add an extra touch of class and personalization to your playing cards by creating a stunning matching tuck box. No need for balls or cages! 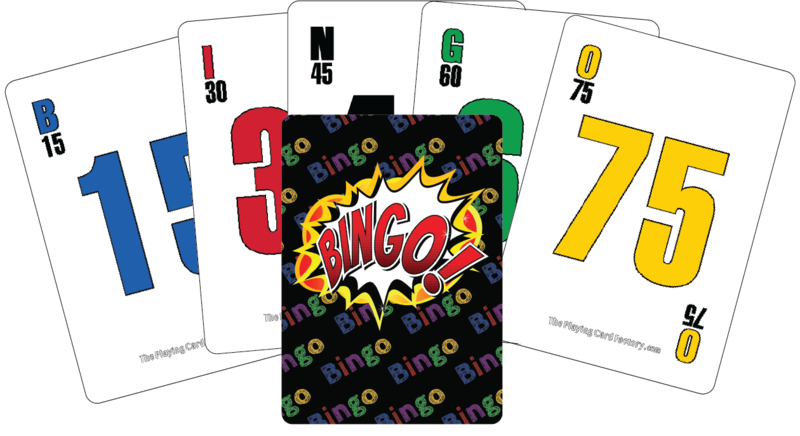 Our colouful plastic coated Bingo Calling Cards are ideal to host a Bingo game anywhere. Just give the deck a good shuffle and pick the top card to call your first number. Every number from B1 to O75 is represented on one poker sized playing card. Our Bingo cards are 2.5 x 3.5 inches. 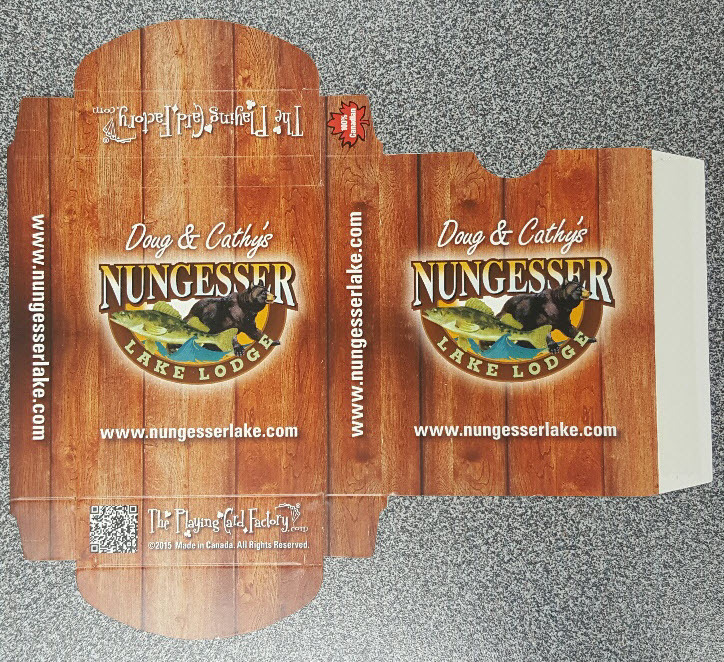 Packed in a matching box to protect your cards between events. This is a standard pre-made item and is not customizable at this time. We received the cards in time. They are on the tables ready for the guests tomorrow. I am very pleased with the quality of the cards. Thank you very much for all your help! I really liked how quickly you got back to me. I also loved how user friendly the The Playing Card Factory website is.